This fabulous Flash Friday first finally brings us to the start of The Flash’s run in his own book. After four tryout issues in Showcase, the accountants at DC Comics decreed that the The Flash was selling well enough to deserve his own title, and the Silver Age was officially under way thus setting the character on a trajectory towards the intersection with the life of yours truly on what I like to refer to as T-Day or Tom’s Independence Day. The independence would not come immediately or without struggle, but, in looking in the rearview mirror, that was where the storm broke. However, that inflection point was still down the road a bit when The Flash #105 hit the spinner racks. The first issue of what was for all intents and purposes an entirely new character continued the numbering from the original Flash run because the publisher Irwin Donenfeld decreed that it would show that the character had a track record. He didn’t think that ten-year-olds would risk their ten cents on an unproven commidity. 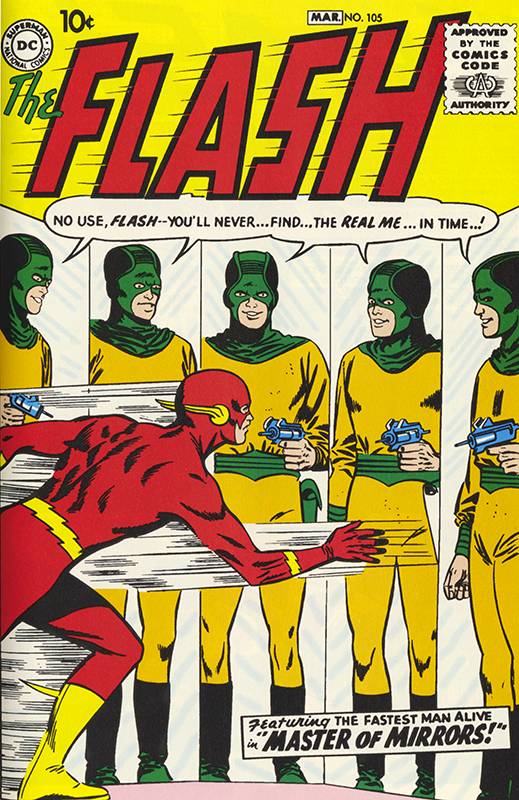 The cover featured the first appearance of the Mirror Master and one of my personal favorites among what would become the Flash’s rogues gallery of villains… but I never saw it at the time. Comic book distribution back in those halcyon days was spotty at best and, in the hinterlands of Ohio, we often didn’t see a comic book hero until it had been well established in the minds of the magazine distributors. Where I lived, the hunting down of comic books required first, foremost and above all else… a car. Something to which I had only limited access. I couldn’t drive but I could bum. Unfortunately, bumming a ride meant hanging out with the folks, as they ran various and sundry errands around town in Elyria. So it meant visits to the tire store, car repair shop, the barbershop, the hardware store and the supermarket. It was like riding a bus that was going nowhere you really wanted to go. Now the barbershop did have comic books, but they were only a cruel tease. You could see ‘em, but you couldn’t have ‘em. You couldn’t take them home and read them five hundred times or more (actually, you could, but that’s a story for another day when I’m positive the statute of limitations has really expired) . Supermarkets were iffy. Most supermarkets didn’t have comic book spinner racks… but every once in awhile you would get lucky (back before getting lucky would mean something else entirely) and you could check out the comics there while your folks bought asparagus. If not, then your only other option was to hope that one of the other so called “important” stops brought you within scurrying distance of a drug store or newsstand. My best opportunities to encounter those esteemed establishments would be on one of my family’s forced marches back to my mythical birth city of Akron where my grandparents’ house was within walking distance of that holy of holies the Rexall drugstore on Brown Street. But we were talking about the cover, weren’t we? I promise to return to Rexall the king of drugstores in a future Flash Friday. Okay, so on the cover we see the Flash running past a series of mirrors showing images of the Master of Mirrors (later we won’t be so formal and we’ll just call him the Mirror Master once we get to know him better) all aiming a blaster at the Flash. Had I seen that, I would have bought it I’m sure. The Mirror Master’s costume struck me as very cool and I probably would have bought the comic for that alone. The first story inside, however, featured The Conqueror from 8 Million BC! This guy, much like Infantino’s depictions of people from the future, was bald. Apparently, people in the past and people in the future are all bald. It’s only those of us in the middle who have hair which makes it a lot easier to tell the good guys fro the bad guys. An archeologist is digging on the outskirts of Central City when he uncovers a cavern wherein resides Katmos a supreme ruler from Earth’s past. Katmos is all silver metallic and, had Stan Lee been writing this, he no doubt would have been dubbed the Silver Scion. It’s interesting to note that Katmos civilization was wiped out by a comet striking the Earth back in the day. I’ve often suspected that Flash writers John Broome and Gardner Fox had a copy of Scientific American at hand when crafting their Flash stories. The influence of editor Julius Schwartz, a science fiction fan and former agent for SF authors was no doubt considerable, but the Flash writers also seemed to have an avid interest in science and were aware of the cutting edge scientific theories extant at the time. The readers of the Flash were often given an early introduction to concepts that would only later become widely accepted and commonplace. It was one of the things that set the Schwartz edited books apart and that attracted ten-year-old-inquiring minds. Since this was the Flash’s first outing in his own title, Broome briefly recaps the Flash’s origin story before moving on to deal with Katmos. Katmos immediately captures the Flash and imprisons him in a cylinder which Flash escapes by vibrating his feet so fast on the bottom that molecular pressure builds up and shoots the cylinder several miles into the air (the writers may have had an interest in science, but they weren’t necessarily fanatics about accuracy). While several miles into the air doesn’t mean the Flash was launched into space, it’s close enough for me to include it in my running tally of how often the latter happens which will now stand at two. The Flash returns, knocks out Katmos, and the story ends with Barry and Iris heading off to dinner. The second story introduces a new villain to the Flash canon, the Mirror Master. Infantino as I stated earlier provides a cool costume and Broome an equally cool background for the man named only as Scudder. We learn that Scudder picks up his skills working with mirrors in prison and is soon proficient enough to create holographic images before the term was even coined (yet another example of the Flash writers being ahead of us on the curve). He sends a hologram of a bank teller to help set up a bank robbery and Barry happens to be in the bank when the hologram is there. He becomes suspicious when he notices that the teller’s wedding ring is on the wrong hand (and wrong finger actually) and he follows it to the Mirror Master’s hideout. There he discovers various other holograms such as a giant mosquito and a minotaur and defeats them when he deduces that they are creatures of light. One of the attractive things to me as a kid was how the Flash more often than not defeated his foes with his intellect rather than his fists. As someone whose intellect was better than his fists, I found that aspect of the character very appealing. It’s probably why I gravitated towards science fiction in general. The Flash then easily captures the Mirror Master. Since I came to his story late, I already knew that the Mirror Master would be a recurring villain, but, even without that foreknowledge, you could just sense that he would be making return appearances. After the Mirror Master’s capture we return to another recurring theme, Iris and Barry having dinner. They eat out a lot.